The Fly Dressing Qualification and the Meaning of Life. I have been going to AAPGAI assessments weekends for around 5 years now. Eventually I passed my Provisional Single handed in 2012 after a couple of failed attempts. Now don’t get me wrong I really enjoy casting the various types of rods and lines that being at assessments allows but the one thing I have always loved is fly dressing. The spring assessments however are at the wrong end of the year. What I mean is that practice time for the casting assessments is reduced by lack of daylight time and in some cases too much water. Or not enough water! Fly Dressing through the winter however is a perfect way to keep your hand in. So why not take a Fly Dressing assessment? Most of us can do a fairly good representation of a nymph or a dry that will put fish on the bank. How many of us however are prepared to put our efforts in front of assessors to have them admired or pulled to bits? We do it with our casting so why not the tying disciplines? In 2013 in an attempt to get people to take the exams there were a few relaxations on how you could take the fly-dressing exams. Previously it had required a pass at provisional in single or double handed rods. I had my provisional single handed pass so with a big deep breath I got hold of the provisional syllabus, read it through thoroughly and decided I would have a pop at it. Like all the exams in the association this first level is no pushover. It demands a level of knowledge that enables candidates to teach the subject confidently. A capable mentor is an absolute must. Mine was the extremely capable (and nice bloke) Mr Vic Knight. He must have wondered what he was getting into on some occasions. Even more so in the FD tests there is no silly question. If you don’t have any idea ask your mentor. Vic is very good at answering the seemingly silly questions! Tying the flies is of course part of it but there are sections within the syllabus that really are required for the exam. One of these is the materials identification test. It’s part of the written test but the materials are “in the flesh” i.e. no pictures. You can pick it up and play with it to get an idea or confirm to your- self what it is. Of course there are some very general items in the test, (no I am not telling what) but there is always going to be a curve ball in there somewhere. I must have had a good day as I came out with 100% on this part. Then came the written test with questions on the flies, materials and history. It was OK and again had a few questions that required dragging answers from the bottom of the pit. My pit is very deep and the answers needed a lot of dragging. On reflection the tests were both set at the right level. The actual practical test was one and a half hours of demonstrating methods and material, explaining the why and wherefore that it was demonstrated in that way and having the usual “why did he ask me that” doubt. More so than with the casting disciplines the fly dressing exams, and moreover the practical part, has more than one way to achieve the desired effect. You must be happy with a couple of ways to do the required technique. Practice is the only way to approach the subject. LOTS of practice. I must have practised a lot as I passed this exam first time round. Now what? Well the Advanced level of course! If the Provisional is a testing subject the advanced is a subject that WILL stretch your knowledge. 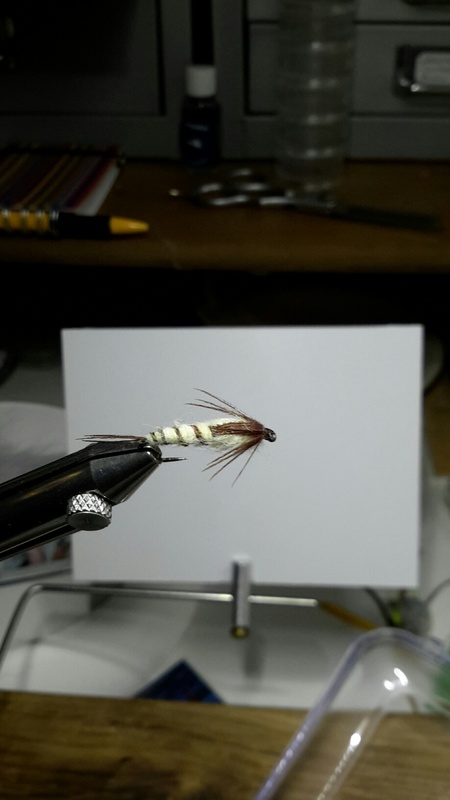 There are more flies to tie (10 instead of six) requiring different techniques, more materials to look at, more techniques to tighten up on and like the casting qualification a presentation to do. The written test is a little more difficult as in the casting test too. You want testing though right? 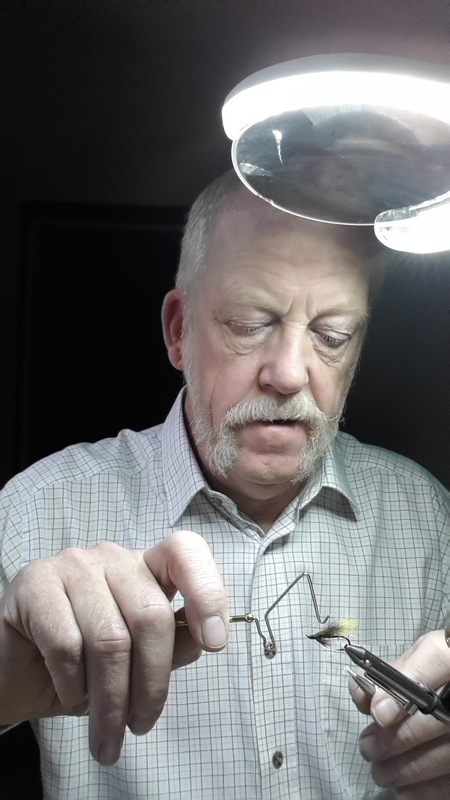 If you have been tying flies for a while and have come down the route of having lessons previously then you will most likely have the knowledge in the ”pit” to get through the tests as tests are what they are. A good understanding of the foundation techniques are simply a must have. If not then get a good mentor and work together to bring your levels of skill up to those required before considering the exams. Like the casting exams if you don’t know the technique and can’t perform it you can’t teach it. Read lots and soak up the information. Watch as many videos on You Tube as you want BUT be aware there are some great videos as well as truly awful ones out there. Pick the good techniques out and practice them all, not all the videos have the right techniques in them. And don’t forget the tools and equipment needed. Vices? Scissors? Whip finish tools, bobbin holders, dubbing needles, dubbing whirls, magic tools and a myriad other items need to be seen and used. So you can answer the question. IF it comes! As Mr Knight delights in saying “Failing to prepare is preparing to fail”! See comment at the start of this article ref the spring assessments! If I could pass on one piece of advice it would be that if you feel your preparation is not at the right level don’t sit the exam. The assessors will appreciate it. Fly Dressing is a MASSIVE subject and one which, like any of the casting tests, should not be under estimated. If you enjoy being put through your paces and stretched to the max then why not consider the Fly Dressing tests. You may find you know more than you think. Oh and yes I passed the Advanced level first time too. So where to now then?